Gusty winds swept through San Diego County Monday, causing potentially dangerous driving conditions through Wednesday. 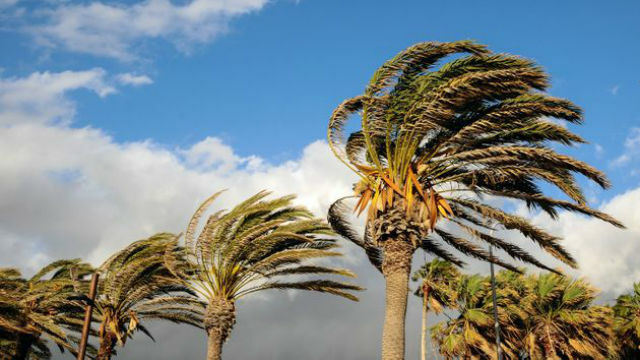 The National Weather Service issued a high wind warning for the county mountains and deserts. The warning was originally set to last through 2 p.m., but was later extended to 4 p.m.
A wind advisory is set to take effect at 6 a.m. Tuesday and last through noon Wednesday for the county mountains and valleys. West and northwest winds Monday were expected to range from 40 to 50 mph, with gusts reaching 75 mph possible near mountain ridgetops, forecasters said. The winds are expected to turn northeast and decrease slightly Monday night, with winds of 25 to 35 mph and gusts near 55 mph possible Tuesday near mountain ridgetops and along coastal mountain slopes. Winds in inland valley areas will range from 15 to 25 mph with gusts of 45 mph possible. Powerful winds could whip up sand and dust and create potentially hazardous driving conditions, especially for high-profile vehicles, the NWS said. Officials urged drivers to be cautious in low-visibility areas and look out for possible downed trees and power lines. A beach hazards statement warning of minor coastal flooding during high tides is in effect through Tuesday morning at the county beaches. Waves of 3-6 feet will be possible along with strong rip currents, forecasters said.